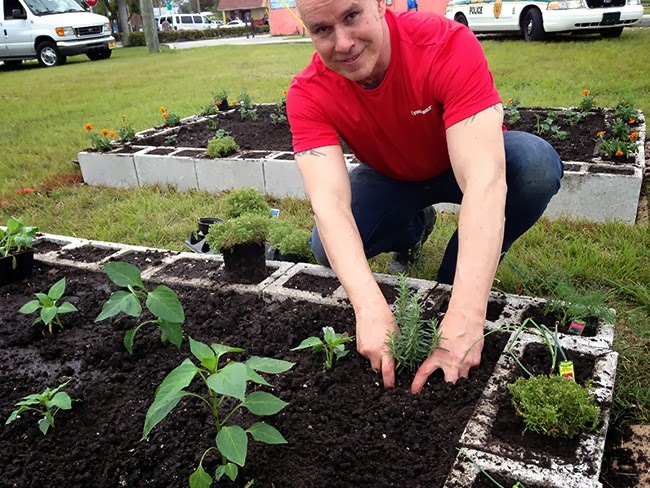 As I mentioned in my last post, Troy-Bilt invited 6 of us bloggers, known as the Saturday6 to help Troy-Bilt construct a community garden in the community of Perrine, Florida. Troy Bilt flew us down to Miami for two days, as part of our Saturday6 sponsorship duties, and since we are the same Saturday6 as last year, the event was fun, and it was nice to visit with our old friends, as we come from all corners of the country. One day one (a Thursday) we toured Vizcaya palace, as you read in my first post, but Friday was the day that we all volunteered our services for, to help build a small, community garden along with a new chapter of the Keep America Beautiful (KAB) project, a group that Troy Bilt sponsors. 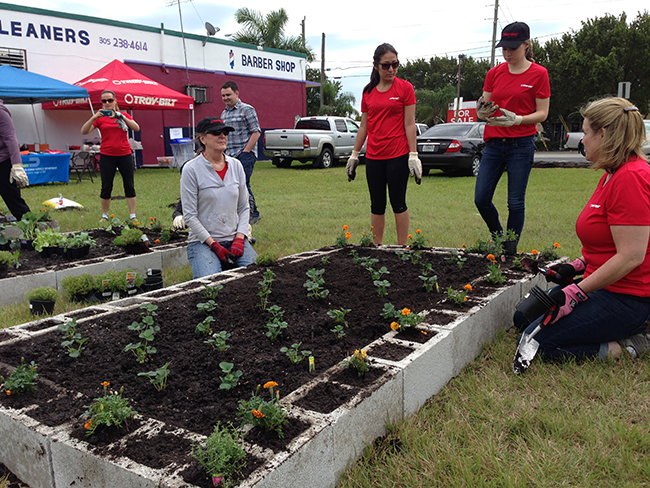 Along with the new chapter of KAB in Miami Dade County, Troy Bilt employees, their agency and the six of us bloggers, we built 6 raised beds, and planted them with vegetables, flowers and even strawberries. The best part was, the community became involved too, with land donated by Henry's Dry Cleaners and a barber shop, this vacant corner lot in the town of Perinne, is being transformed, and we were have to plant the roots of this project. 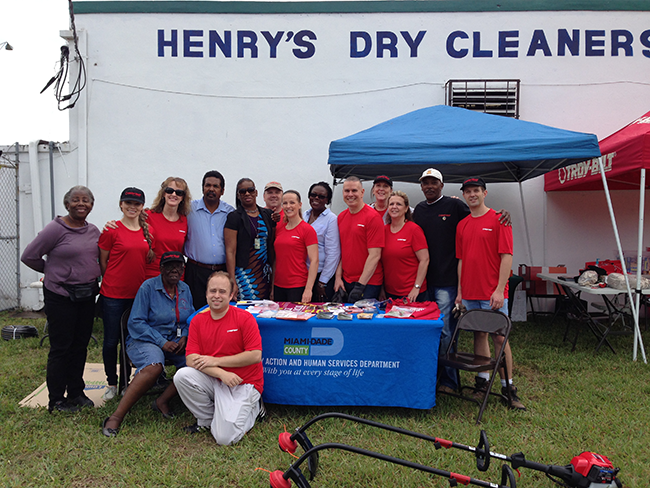 Our Troy Bilt Saturday6 team along with community leaders, Tory Bilt staff and the new chapter of Keep America Beautiful, Dade County. Noelle planting tomato plants in the first bed that we all completed. Noelle Johnson, a horticulturist and talented garden designer from Arizona, who authors the blog AZPlantlady: her blog is full of great gardening advice for everything from fruit trees to vegetables. I don't know how Noelle does all that she does, and so cheerfully, she has a large family, with grown kids, as well as three younger children, she seems to do it all, effortlessly, and I know, it isn't effortlessly. Helen Yoest helped us measure the beds, which had to be constructed on the surface of the soil, because of the limestone rock which lies just below the surface. Helen Yoest, noted author and plant evangelist from, Raligh, NC who writes the blog Gardening with Confidence. Here are some of her books: Gardening with Confidence, and her newest one, hot off of the presses is Plants with Benefits. Helen is well known in the plant world, and her expertise is broad, sitting on the board at botanical gardens, to writing many posts for other sites. She must never sleep. Steve Asbel, from Florida, who writes the blog The Rainforest Garden, and just authored a book called Plant by Numbers, a book that I will be doing a giveaway with soon ( along with Plants with Benefits). Steve is also a talented artist, his illustrations can be seen on seed packets from Ferre Morse to other blogs that feature his work. 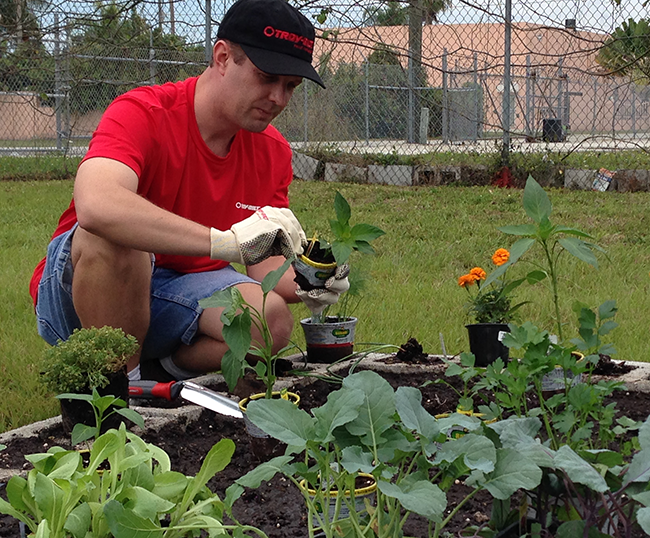 Dave, a veg expert, helps prepare containers for planting, by carefully removing the container without disturbing the rootball. We planted pepper, collards, mustard greens, herbs, tomatoes and strawberry plants, as well as seeds of carrots, string beans and sunflowers. 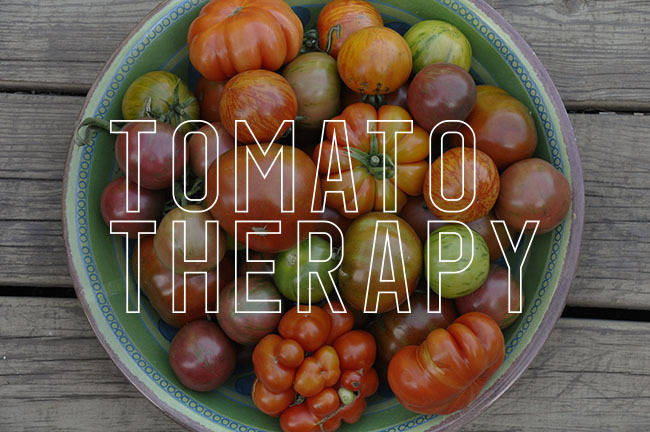 Dave Townsend, from Tennessee, who writes a prodigious amount of informative posts about his large home, vegetable garden on his popular blog Growing the Home Garden. I enjoyed hearing about how many pepper varieties he was growing this year ( like 35, or something like that!). Dave has a beautiful family, and I envy his lifestyle in rural Tenn. It seems so peaceful in that part of the country, his kids are so fortunate to have such engaged and caring parents. 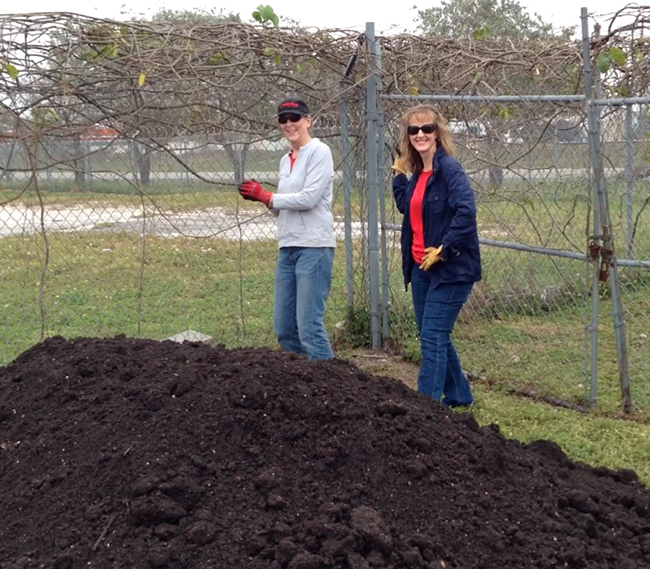 Amy helped us till the soil, manure and organic material in using both pitch forks and a Troy Bilt Cultivator, which slowly tills the soil in gently, without ruining soil texture like a large Rototiller would. 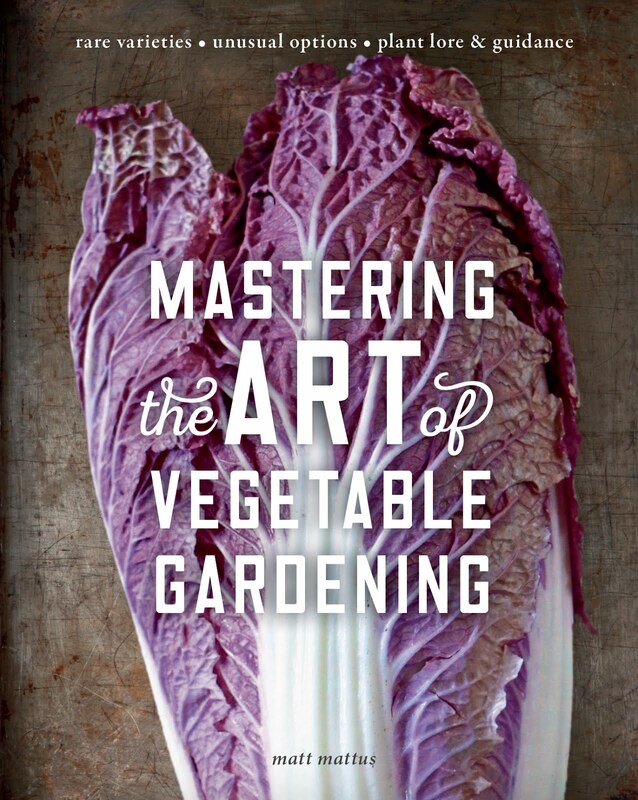 Finally, Amy Andrychowicz from Minnesota, who authors the beautiful blog Get Busy Gardening. Amy and I always tease the nice folks from Troy Bilt that they should really let us do a giveaway with snow blowers instead of lawn equipment, but maybe Troy Bilt has something up their red sleeves! Amy and I live where there is still lots of snow this winter, and we are both eager to get out and Get Busy Gardening. 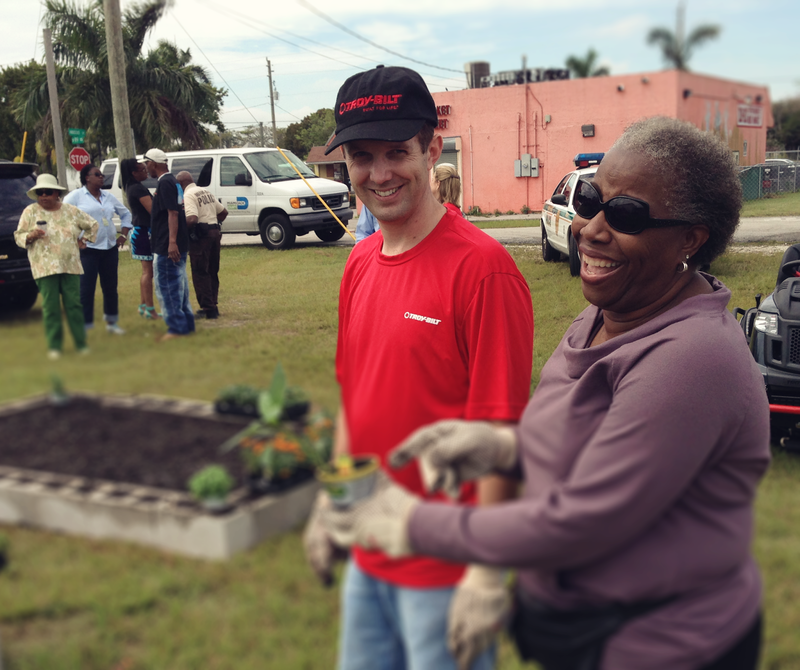 We became friendly with many neighborhood people, from the community of Perrine, inviting them to join us as we built their garden. 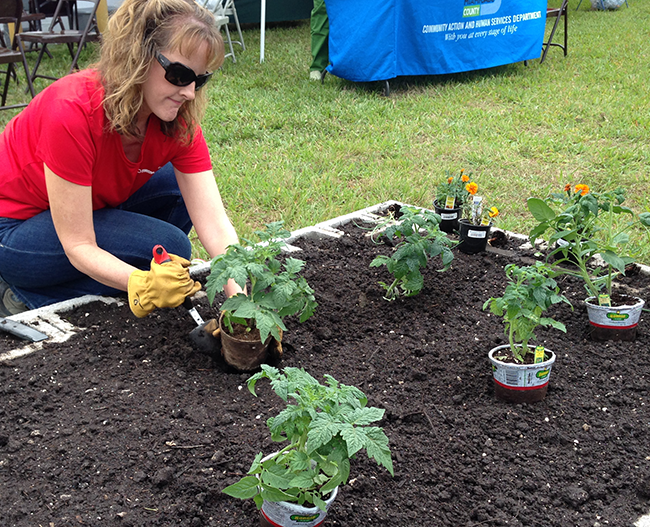 Our Master Gardener from the area Shiela Martinez shared her insight on local crops that would do well in the hot, Florida sun. 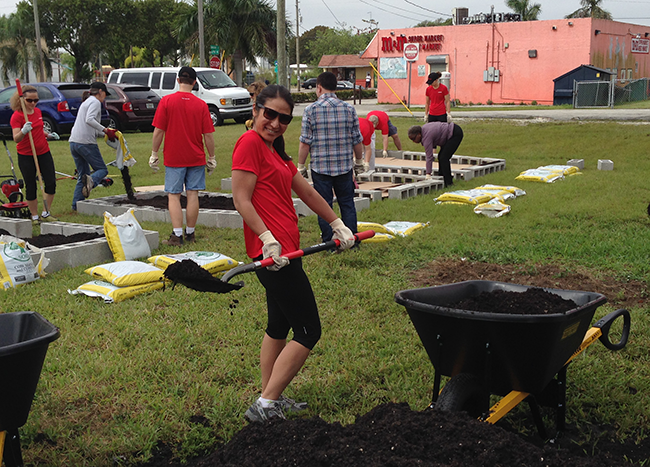 Julie Sur who came along with Troy Bilt's agency helped spread manure, clearly, her favorite task, as you can tell. Not a speck on her, how does she do it? (we all wondered). 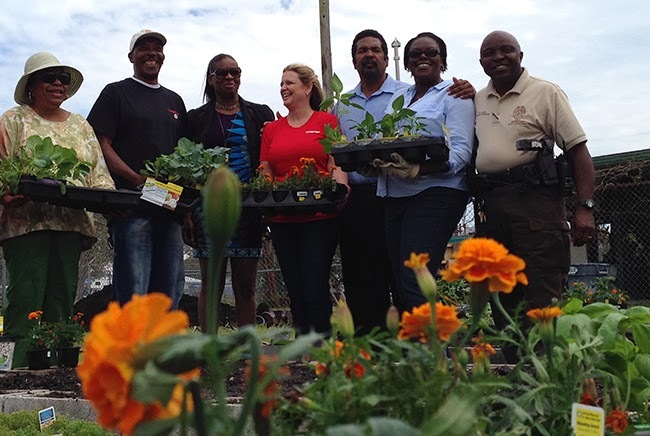 We had help from many others, ranging from a local Master Gardener, Shiela Martinez, to a sweet 79 year old woman who is sort of a community leader from Perrine, Ms. Townsend. Ms. Townsend and I really connected (to the bemusement of others, but maybe because I am surrounded by elderly people all the time!). 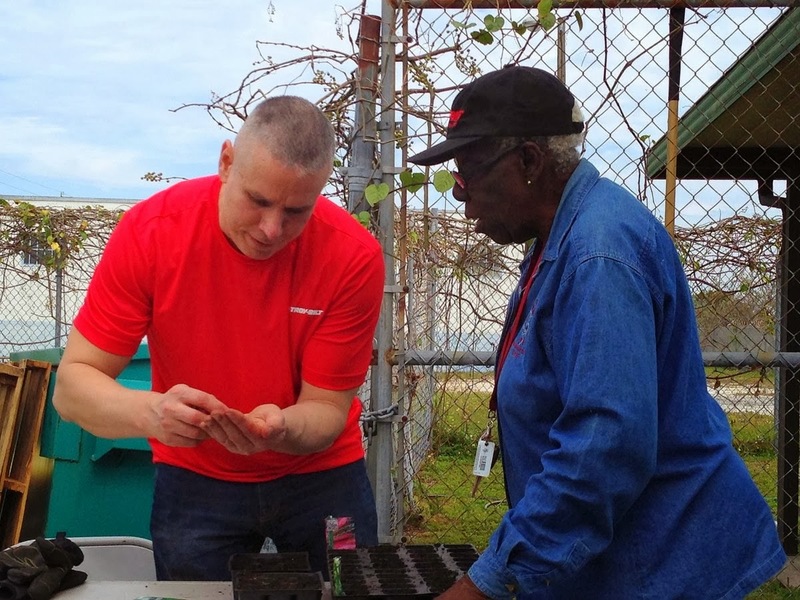 I showed her how to plant seeds in cell packs, so that younger community members could plant seedlings later in places where some plants might have failed, and she started telling me about the history of the community of Perrine, as well as a bit about her personal history. 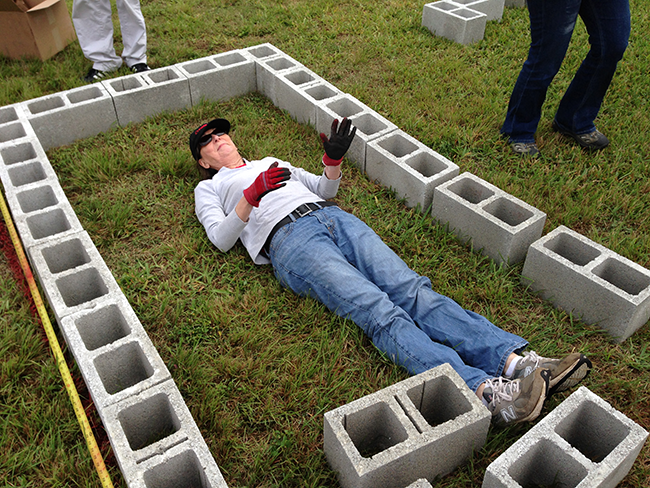 Helen rests her back, after planting a perfectly perfect bed of strawberries. In 1910, the community known today as Perrine started as a railroad camp, built during the construction of the Florida East Coast Railway. In those days of segregation, the community grew in a segregated fashion, with the area to the east of the railroad being primarity white, and to the west, all black. The community was named after Dr. Henry Perrine, which in 1839 had been granted a survey project in the area by the US congress in recognition of his service as US Consul in Mexico - with the ultimate goal for hiem to introduce new tropical plants and crops from tropical countries into cultivation in the United States. I asked Ms. Townsend if she was always from Perrine , but she said " Oh no. I was raised in Hastings, west of here. 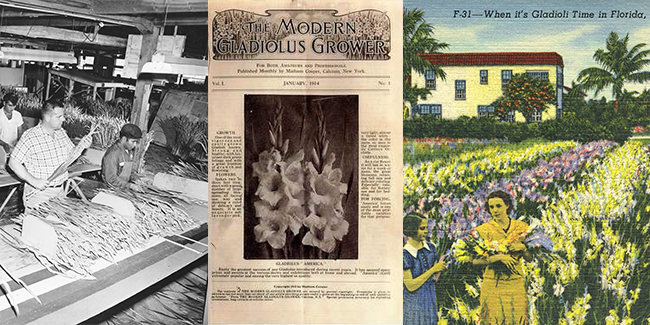 My mother and father worked in the gladiola fields, and I helped harvest gladiola until I was 15 years old". I knew about the South Florida Gladiola industry, from both my involvement with the Gladiolus Society and through researching the genus and its history for an upcoming paper for the North American Rock Garden Society journal, but what I didn't know was the connection with the Deering tractors, something I only learned on this trip. Most every crop grown in South Florida today, has connections to these early tractors, and the community of Perrine even has a connection, as it was named after an early botanist named Dr. Perrine, who lived in the Florida Keys in the mid 1800's. He was hired by the US dept. of Agriculture to introduce new subtropical crops to florida, from Mexico and other tropical areas. He was killed in an Indian raid, but his family continued to be involved in agriculture and medicine, and the town of Perrine was named after the Perrine Grant, which included hundred of acres in South Florida. 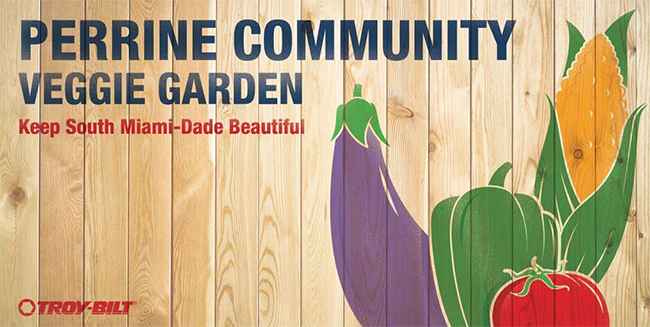 Vizcaya estate and Mr. Deerings brother's estate south of Coconut Grove were built on former Perrine land. Just as we struggled with the coral and limestone near the surface here in Perrine, early farmers did too, that is, until a special 'coral crunching' tractor from Deering McCormick helped clear the land, both for draining water from wetlands so that Perrine farmers could grow tomatoes ( the area was known as the tomato king of America) but also throughout the South Florida area, west to the coast, near Hastings, where the older Ms. Townsend picked potatoes and cabbage from the local farms. I was so surprised that there were Cabbage farms here, but she told me " Oh, yes….cabbage was a big crop in the winter months. We would do everything from planting seedlings to harvesting heads, which the farmers would then ship up north". And here I was showing this lovely lady how to plant mustard green seed, essentially a cabbage, something she never had the chance to. It was a nice experience to connect on so many levels. 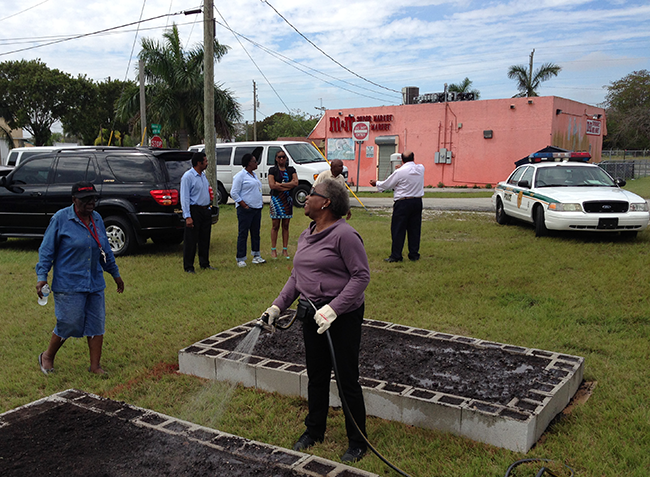 I never thought of Florida being a potato growing area, but as Ms. Townsend explained to me, the area between Hastings and Perrine, grow many potatoes, and she worked on these farms as a laborer until 1960. 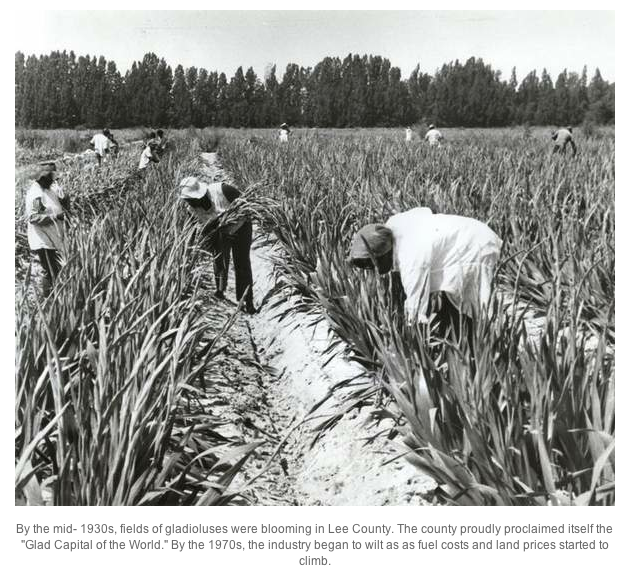 Throughout the first half of the 20th century, the Perrine Grant land opened up some of the finest vegetable lands in the world for winter truck farming, farming that only became possible with the strength of the effective Deering tractor. 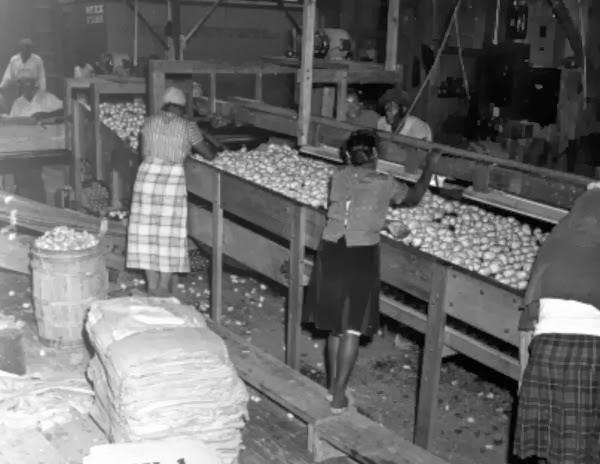 By 1920 over 700 acres of tomatoes were grown in south Florida, and in the busy season, 3,000 crates per day were marketed by train to the great northern cities including Irish potatoes, Bermuda onions, cabbage, and gladiolus. ( source - Official Directory of the City of Miami, 1904 - 1940). Here I am adding some herbs, that we had extra plant of, near the edge of one of the beds containing peppers. With snow still on the ground at home, it was so nice to smell the earth and to get hands back into the soil. 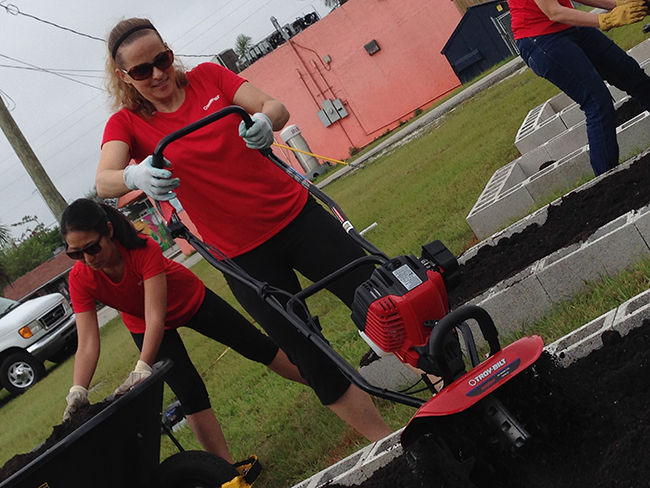 Thank you, Troy Bilt for this very special opportunity to give back! 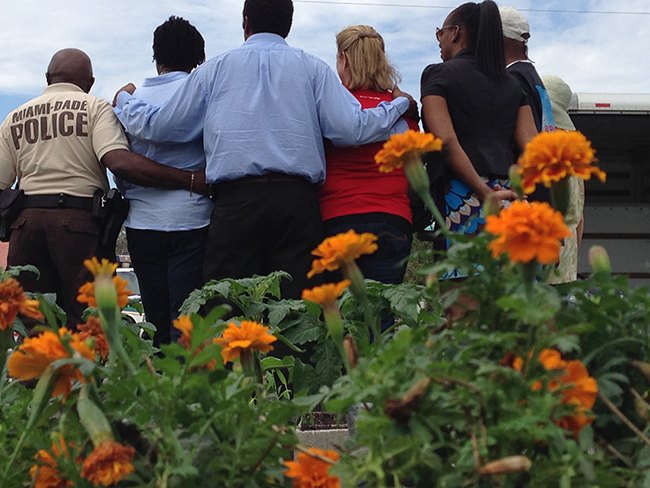 The entire community joined in, even a local policeman joined us for a photo. 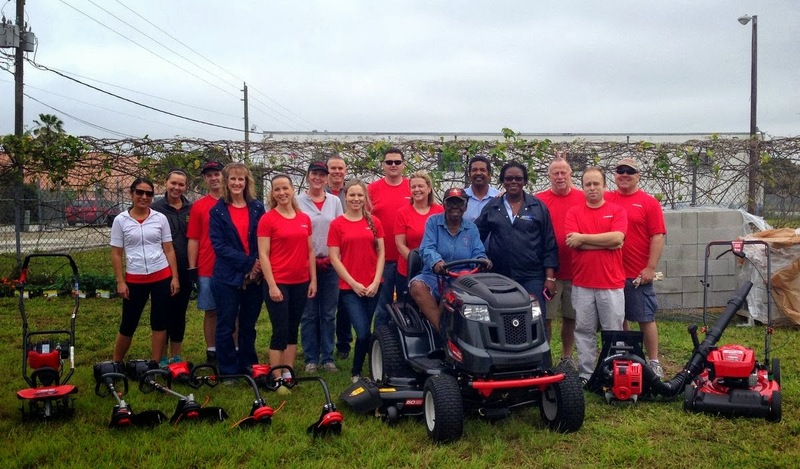 Perrine community leaders post with our leader from Troy Bilt. What a wonderful opportunity and give back to the community! Looks like it was fun too! I work for the Hastings Branch Library and we are currently working on digitizing the Hastings, FL. history. Is there anyway that I can get the picture of the gladiolus fields and Mrs. Townsend to put in our collection? 8 GREAT PLANTS FOR CONTAINERS, AND A WINNER!